In the never-ending conflict in Lebanon, everyone, regardless of religious sect or political party, has suffered or lost a loved one. In August 2006, during the weeks of continuous Israeli air raids on Beirut, the director and her friends share with their parents a desire for peace but take different routes of action to express it. The Christian Maronite director involves her whole family and her friends in the production of the film, revealing the honest feelings—bordering on resignation—that arise from a life lived in daily chaos. [Director’s Statement] In a sectarian state like Lebanon, people are born, raised, and defined through their sectarian identity. As for myself, I was born in Beirut in a Christian Maronite family, and this religious belonging became, since my early childhood, my identity. I can remember that during the civil war in Lebanon, my father took us to the mountains, an area totally inhabited by Christians, where he thought we would be protected from sectarian massacres. There we were not directly exposed to the sectarian combat, but to the “protection” of a fanatic Christian militia (the Lebanese forces) who, in the name of Jesus Christ and under the slogan of “protecting the Christian community,” was brainwashing us against Muslims, Palestinians, Syrians, and other Christians who would be different. After the war, from 1990 till 2005, I spent 15 years realizing how much sectarianism destroys human beings, how much it erects a barrier to mutual understanding and social justice. I can see it clearly in my environment: my parents, my uncles, my sisters closed and isolated themselves in their Christian identity and till today they act as fatalist minorities, fearing everything. 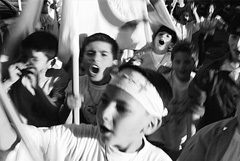 Lately, since the 14th of February 2005, Lebanon has been living on the edge of war. It is a very tense situation, sectarianism has been growing stronger among different communities, and I personally fear that a new civil war is approaching. I believe cinema is a medium of confrontation and opens dialogue between people. To that end, based on my personal experience and environment, I decided to make a film that confronts sectarianism, giving space to non-sectarian young characters to challenge their own upbringing, their society, and their state, hoping to bring true change. Born in Lebanon in 1972, Raheb graduated with a degree in audiovisual studies from the Institute for Scenic and Audio-Visual Studies (IESAV) at Saint Joseph University in Beirut in 1994. She has directed two short fiction films, The Last Screening (1995) and Meeting (1996), and three documentaries, So Near, Yet So Far (2002); Suicide (2002), which aired on Al Arabiya TV; and This is Lebanon (2008), which aired on ARTE/ZDF. She is one of the founders of Beirut DC, a cultural cooperative for cinema, where she has been the artistic director of the Arab film festival Cinema Days of Beirut since 2001. Raheb has taught documentary film courses at IESAV since 2002.